Ahlborn, Heinrich “Henry” T. (1830-1907), was born in Hanover, Germany on December 23, 1830, the son of Heinrich and Henrietta Ahlborn. He was a tailor and a cobbler. According to the 1900 U.S. Census and Attinelli in Numisgraphics he moved to America in 1850. Residence : Lawrence Street, Malden, Massachusetts. His Stationery, Books and Coin shop was first located at the Old Cambridge Toll House on West-Boston Bridge, and by 1878, he moved to 33 and then to 31 Exchange Street, Boston, Massachusetts. An immigrant tailor from Hannover, Germany he moved to Dedham, Massachusetts. On October 15, 1857 at Dedham, Massachusetts he married a native of Brunswick, Canada, Rebecca Flemming. For some odd reason he claimed at the time to be born 1834 though his wife was born 1838. In the 1900 U.S. Census it reads he was born in April 1832 and that Rebecca was born in December 1841. Moreover, Emmanuel Joseph Attinelli records his birth as April 1835. Apparently he preferred April over December for his birthday or else the death certificate gives the wrong age at the time of death. Though married 43 years in 1900 the Census reports they were married 36 years. About 1860 he opened his shop at the Old Cambridge Toll House on West-Boston Bridge, Boston and later on turned coin dealer. One early purchase from Chadbourne around 1860 for $5.00 raised the ire of his wife, which was amended after he sold the coins for a profit. Mason calls him “Henry I” and Henry Cook as “Henry II”. In 1865 he sold Parmelee $200.00 in coins. In December 1871 he was a bidder and a buyer at the Dr. Charles Clay sale held by W. Elliot Woodward at George A. Leavitt’s auction house in New York. On January 29, 1875 his coin shop was robbed of $700 worth of coins. In November 1876 he won at a Cogan auction a VF 1794 silver dollar for $80. He eventually sold it to Major William Boerum Wetmore (q.v.). Fig. 1. 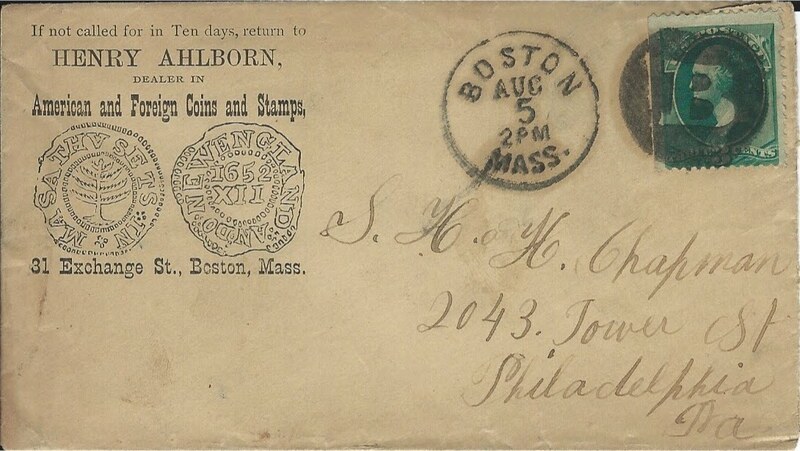 Henry Ahlborn post card giving notice of his change address to 33 Exchange Street, Boston, Massachusetts in September 1878 printed on a U. S. Postal Card (Scott # UX5 PC2) issued in September 1878. Courtesy the Lupia Numismatic Library, Ahlborn File. 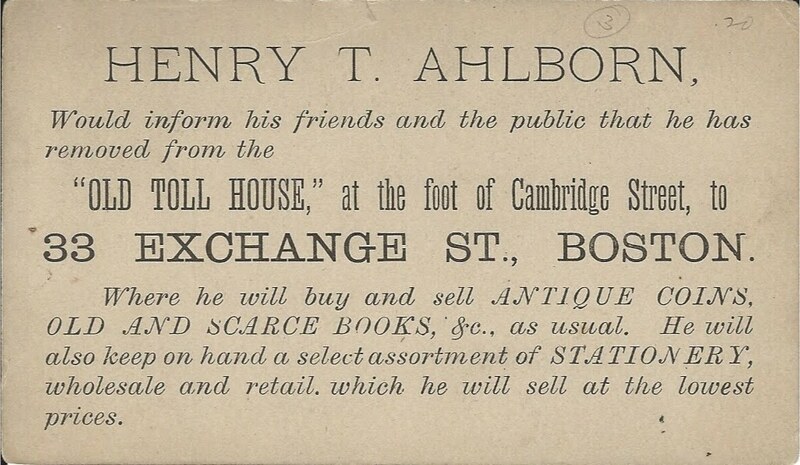 In September 1878 he moved his coin shop from the Old Cambridge Toll House on West-Boston Bridge to 33 Exchange Street, Boston, and advertised in Mason’s Coin Collectors’ Herald. In 1880, he changed the address to 31 Exchange Street, Boston and had business envelopes printed. Fig. 2. One of many of the Henry Ahlborn's business envelopes and letterheads sent to the Chapman Brothers in the Lupia Numismatic Library, Special Collection, The Chapman Family Archive, this one postmarked August 5, 1880, Boston, Massachusetts. Note the change of address to 31 Exchange Street, Boston, Massachusetts. Courtesy of the Lupia Numismatic Library, Special Collection, The Chapman Family Correspondence Archive. There are thirteen pieces of correspondence catalogued from Ahlborn to the Chapman Brothers in the Lupia Numismatic Library, Special Collection, The Chapman Family Correspondence Archive. In 1880 he purchased the 1804 Silver Dollar from Phineas Adams, and soon sold it to John P. Lyman along with a set of silver dollars for $1,800. In May 1880 he became ill with typhoid fever. He conducted business with the Chapman brothers from 1880 to 1882. His collection was sold at auction by John W. Haseltine (52d sale) on June 16-17, 1881. His Malden home was struck by lightning in 1884 on June 19. The lightning struck a tree uprooting it breaking the water main flooding his house. His wife fled to a neighbors home becoming ill needing a doctor. On one occasion the Chapman brothers broke an antique plate-glass while visiting his shop. On March 18, 1889 while walking home in Malden, a railroad sign fell and struck him breaking his right shoulder blade at first it was thought he would recover. The newspaper the following day ran the news that his condition was serious and it was feared he would not recover. He died of bronchial asthma on November 29, 1907 twenty five days short of his 77thbirthday according to his death certificate. He was buried in Saugus, Massachusetts. Among his other famous coin sales is the 1796 half-dollar in about uncirculated condition he sold to Lorin G. Parmelee for $150. Mason’s Coin Collectors’ Herald, Vol. 2, No. 1, June (1880) : 2a; Mason’s Coin Collectors’ Herald, Vol. 2, No. 2, September (1880) : 12b, 13b; Mason’s Coin Collectors’ Magazine, Vol. 4, No. 1, June (1882) : 13; Mason’s Monthly Illustrated Coin Collector’s Magazine, And Coin Prices Current, Vol. 1, No. 2, July (1884) : 21d; VI, No. 1, January (1872) : 16 “Clay Cabinet”; H-I, No. 1, June (1879) : 3b; H-I, No. 1, June (1879) : 8c; H-II, No. 1, June (1880) :2a; H-II, No. 2, September (1880) :11a; Mason’s visit in May 1880, Ahlborn was out having typhoid fever. H-II, No. 2, September (1880) :12a; H-II, No. 2, September (1880) : 13b; “Sale of the Smith Cabinet,” (Mason), H-II, No. 3, December (1880) : 18c-19a, 20c; H-III, No. 2, September (1881) : 45d; C-IV, No. 1, June (1882) : 13; C-VI, No. 1, June (1882) : 20B ad page; C-VI, No. 2, September (1882) : 27; M-I, No. 2, July (1884) : 21; M-1, No. 5, October (1884) : 51; M-XIII, No. 1, June (1890) : 10. Haseltine Sale 52, June 16-17, 1881. “The 1804 Dollar,” American Journal of Numismatics, April (1887): 87.